How covering the Royal Wedding gave me a much-needed burst of joy. 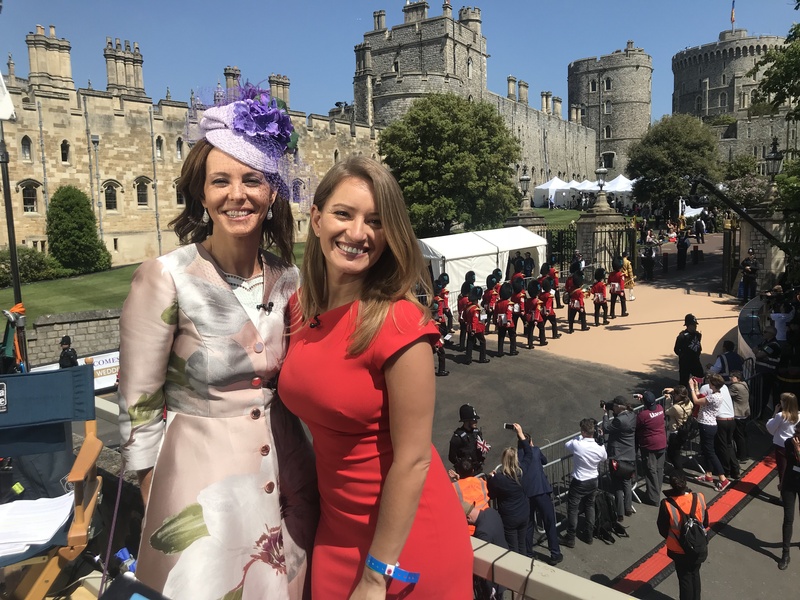 Last week, I had the good fortune of traveling to England to cover the Royal Wedding. Of course I was excited about the opportunity to fly overseas to cover a historic event, the likes of which I’ve only ever watched on my own television from thousands of miles away. But as an anchor on a political news network, I was most looking forward to flexing a different muscle. To living 48 hours without Trump Tweets. To trading Washington for Windsor. To catching my breath from this relentlessly red-hot political climate. I knew the fascinators and fandom would make for an unforgettable weekend. I was not prepared for the camaraderie this ceremony inspired; that myself—along with the 29 million people across the world who climbed out of bed and put their plans on pause to witness Meghan and Harry’s union—would be active participants in a tradition so much larger than any one (or two) people. As cliché as it may sound, the love in the air took all of us out of our corners. It wasn’t about whether or not Meghan looked better than Kate did on her big day, or if the Queen really approved of her grandson’s bride. When the new Duke and Duchess of Sussex traversed the crowded streets of Windsor in their fairy-tale carriage, it was about the pure joy and hope that the world’s biggest fans of the most Royal family felt for Prince Harry and his new wife. Many are calling Meghan and Harry’s wedding a break from tradition. I would argue that this is incorrect. Instead, their union is a truly extraordinary evolution of tradition. Meghan Markle is our modern day Duchess. Only a few years ago, it would’ve been outrageous and unfathomable to think a British Prince would marry a biracial Hollywood actress from the United States. This is a lesson in progress. When we open up our minds and our hearts, we can make things happen we never dreamed possible. Though I may not have been celebrating alongside George and Amal Clooney, the Royal Wedding served as a reminder that as Americans, we too are part of something much larger than ourselves: a democracy in which our conflicting viewpoints are celebrated. Where each day is an opportunity to share, amend and defend our beliefs. In today’s increasingly fiery and furious political environment, we are forgetting about this luxury. Our rage is blinding. It’s impeding our ability to meet our opponents halfway. From giving them credit where it is due. When I posed with Sarah Huckabee Sanders for a picture following last month’s White House Correspondents’ Dinner, it was not because I agreed with everything (or any) of what she said from the podium the day before. It was because in that moment, I credited her ability to brush off a tense night in the spotlight. It takes a thick skin to recover from any roast, and she seemed to take it in stride. Had it been me, I would have gone from the hot seat to a hotel suite with a large pizza and a pint of Chunky Monkey. Maybe all we need to do is remember that even our fiercest adversary is human. It’s not about changing their mind—it’s about opening ours. Because that’s where we can all move forward and be a little bit better. Why Doria Ragland is my hero.